4 April 2018 was a special day in the life of Emilienne Pambo Bouassa. Emilienne, a Customs officer from Gabon, was attending the festivities in Dakar, held by Senegal Customs in the presence of the country’s Minister for the Budget, in commemoration of the anniversary of the country’s independence. Her beige uniform stood out from among the sea of blue uniforms worn by the Senegalese Customs officers. Then came the decoration ceremony for deserving Customs officers. On hearing her name called by the Minister, Emilienne stood before approaching him to receive the Senegal Customs medal of honour for services to the Administration. A few minutes later, she pinned to her uniform the medal of honour awarded to her back in January 2018 by her own Administration following 30 years of service. “Gabonese Customs seeing fit to bestow a medal of honour on me is one thing, but to have one awarded by Senegal Customs just seemed like an impossible dream,” she explained to any well-wishers at the ceremony. At the time of her appointment, Gabon had no network of Customs attachés to speak of, and so Emilienne was the first Customs officer to take up this position. Others would be appointed later in Brussels, Paris, Washington and Beijing. Gabon and Senegal enjoy strong diplomatic relations: since the 1970s, many Senegalese nationals have settled in Gabon. Emilienne knew Senegal well because her husband had been living there for two years by the time she was appointed to the RILO, and she had already visited Senegal Customs to study the Administration’s Customs valuation practices, among other subject areas. So, her subsequent arrival in Senegal passed relatively smoothly. She knew she was embarking on uncharted territory, but she also knew she could rely on her family. 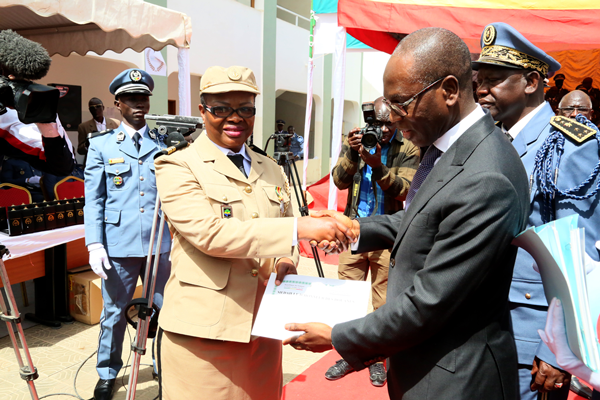 Although the Gabonese Customs Administration she joined in 1988 as an Inspector-Auditor had long been accustomed to women (the first woman joined Gabonese Customs in 1980), when she first joined Senegal Customs, by contrast, she found no women at all among its ranks. The law provided that only male Senegalese nationals were permitted to join the ranks of the Senegalese Customs Administration. However, the Director General sought change, and Emilienne’s arrival would allow him to achieve that very aim. On joining the RILO for West Africa, one of Emilienne’s specific tasks was to reactivate the RILO for the Central Africa region, the idea being initially to manage the two offices from Dakar. However, the structure that she joined was disjointed and had only one operative, namely a Senegalese public servant seconded to the structure, but also having a number of responsibilities at national level, dealing, for instance, with matters connected to the Senegalese Intelligence Office. Uncertain about how a RILO should operate, Emilienne turned to the WCO, which suggested that she join the Scholarship Programme and complete her traineeship at the RILO for Western Europe. On her return to Dakar, Emilienne, together with her Senegalese colleague and the newly appointed head of the RILO, drew up an action plan setting out objectives and priorities. One of the RILO’s tasks is to produce analyses. For such purposes, all administrations in the region must be aware of the intelligence in their possession and input their data into the database of the WCO Customs Enforcement Network (CEN). One of the first objectives of the team would, therefore, be to secure the approval of the Directors General for establishing a framework instruction on intelligence within the administrations. To that end, the Directors General were first required to familiarize themselves with the RILO and its functions. The team requested that an item on the RILOs be included on the agenda of the annual Conference of Directors General of Customs of the West and Central Africa region. The draft framework instruction was presented and agreed at that conference. The Directors General undertook to set up, in their respective administrations, a structure responsible for intelligence, and thus for gathering information on fraud and forwarding it to the RILO. Once the national structures were in place, their members were invited to Dakar to receive training in the use of the CEN, and to familiarize themselves with the relevant WCO tools. However, since travel expenses were not included, none of the countries invited took up the invitation. The RILO team successfully requested financial assistance from the Director General of Senegal Customs. The inaugural meeting of the RILO team and its national counterparts was subsequently held. Consequently, through hard work, the RILO for Central Africa was reactivated, and a regional fund providing financial support for the activities of the two offices was established. The principle was to ensure that all administrations contributed equally to the funding, in particular, visits to administrations for the purposes of training and raising awareness with regard to the fight against illegal trafficking. The team was soon capable of conducting its own trend analyses. In fact, it was one of their own analyses bringing to light cocaine seizures in Europe on flights from West Africa that would result in the very first operation touching on this area to be organized by the WCO: Operation COCAIR, which has since continued to a sixth edition. As well as being involved in virtually all anti-fraud operations organized by the WCO and its partners, the RILO has also independently organized a regional operation to combat pharmaceutical crime (Operation CRIPHARM), which, for its part, is now in its third edition. Emilienne believes that regional efforts to combat fraud have evolved over the past 15 years. The organization of the services and the officers’ attitudes have improved. Evidence of this progress can be seen in the quantity and quality of the data on seizures reported by countries as well as in the exchanges between the national teams and the two RILOs which, albeit now set up in different countries, still operate in a coordinated manner. Emilienne is personally committed to continuous learning and has become a seasoned trainer. She is, for that matter, a WCO-accredited expert in the field of the WCO’s revised International Convention on the Simplification and Harmonization of Customs Procedures (Revised Kyoto Convention), and is currently undergoing accreditation in risk management.